Updated! 4/2/2017 * The latest update of the JDK 9 updated the –module-path switch. By now you’ve probably have heard of Java 9’s new module system a.k.a. project Jigsaw. If you don’t know about Java 9’s new module system, you should visit Mark Reinhold’s paper on The State of the Module System. Also, you should check out @nipafx Nicolai Parlog’s excellent blog at http://blog.codefx.org There he goes into great detail about Java 9’s new module system and many scenarios. In this article I will attempt to show you how to create a JavaFX Helloworld application using Java 9’s module system in 60 seconds. Assuming you’ve installed your JDK and have the appropriate environment variables set. Also, you’ll want to get to the command prompt or terminal and type: java -version to verify the installed JDK. Eg. Java 9 early release build 162. Step 1: Create a directory in your home directory for your project such as the following for Windows OS, Linux, and MacOS respectively. Also, create a src directory under your helloworld project directory. Step 2: Create a directory using a simple naming convention based on Java 9’s new way to organize source code and modules. Step 4: Create a module-info.java file. This lets the compiler know which core module dependencies the application needs to compile and run such as javafx modules. Create a file named module-info.java under the directory helloworld/src/com.mycompany.helloworld. Copy and paste the code below into the module-info.java file. Use vi, nano or notepad. The module-info.java defined above used to have modules javafx.base and javafx.graphics, however thanks to Abhinay Agarwal who pointed out that they are transitive dependencies and don’t need to be added because they are already included when using the javafx.controls module. 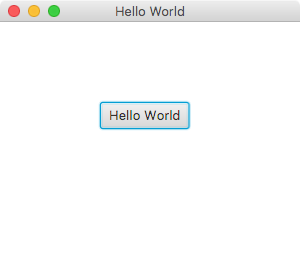 Step 5: Create the HelloWorld.java application file. The file will be created in the directory helloworld/src/com.mycompany.helloworld/com/mycompany/helloworld/ . Copy and paste the code below into the HelloWorld.java application. Step 5: Compile the source code with the -d option with the location of compiled module. The directory for the new helloworld module is mods/com.mycompany.helloworld . Not sure if you’ve taken more than 60 seconds, but assuming your environment is setup and the JDK 9 is installed you should be able to cut and paste the code in seconds. I find the new Java 9 module system pretty straight forward. Although there is a little extra typing in order to let the compiler know where modules are, it’s really not that different than the -classpath option. I can see how large projects can break apart components as modules and benefit from it. I believe these are truly exciting times in the Java world because tools will be able to build thin executables, thus faster load times. I feel it’s been a very long time coming, but a very needed feature that will encourage us to write, manage and deploy modular software. This entry was posted in Java 9, JavaFX, Language on April 26, 2016 by carldea. Is there any IDE support for this yet? Thanks Carl, this is a great on-point article which has really helped me get going with JavaFX and Jigsaw. I agree that Jigsaw is a great innovation for Java and will prove beneficial in a variety of ways. Keep blogging such awesome content! James_D: Both Eclipse and NetBeans have experimental support for Java 9 of some kind (natively, special builds, plugins). I have no idea of Java 9 support for IntelliJ, or any of the many lesser known IDEs.